Locus of Authority argues that every issue facing today’s colleges and universities, from stagnant degree completion rates to worrisome cost increases, is exacerbated by a century-old system of governance that desperately requires change. While prior studies have focused on boards of trustees and presidents, few have looked at the place of faculty within the governance system. 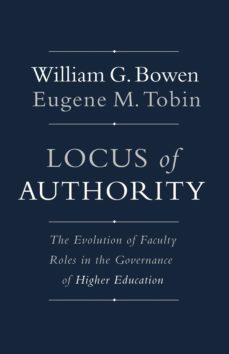 Specifically addressing faculty roles in this structure, William G. Bowen and Eugene M. Tobin ask: do higher education institutions have what it takes to reform effectively from within? Bowen and Tobin use case studies of four very different institutions—the University of California, Princeton University, Macalester College, and the City University of New York—to demonstrate that college and university governance has capably adjusted to the necessities of the moment and that governance norms and policies should be assessed in the context of historical events. The authors examine how faculty roles have evolved since colonial days to drive change but also to stand in the way of it. Bowen and Tobin make the case that successful reform depends on the artful consideration of technological, financial, and cultural developments, such as the explosion in online learning. Stressing that they do not want to diminish faculty roles but to facilitate their most useful contributions, Bowen and Tobin explore whether departments remain the best ways through which to organize decision making and if the concepts of academic freedom and shared governance need to be sharpened and redefined. Locus of Authority shows that the consequences of not addressing college and university governance are more than the nation can afford.